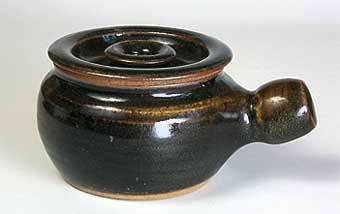 Covered Winchcombe soup pot - 4¾" (120 mm) diameter, 3" (76 mm) high. 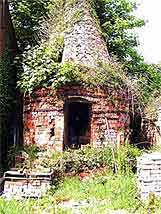 The Winchcombe Pottery dates back to 1926, but there previously had been potteries on the same site. It was started by Michael Cardew when he left St Ives, having been a student, a potter and a friend to Bernard Leach. Cardew was joined by Elijah Comfort, Sidney Tustin, and later, Sidney's brother, Charlie. In 1939 Ray Finch took over the management of Winchcombe while Cardew went back to Cornwall to set up another pottery at Wenford Bridge. After the war, Cardew's hands were full - with his new pottery, and work in Africa - and he sold the Winchcombe to Ray Finch. Throughout the post-war years, Finch enjoyed the company of many potters - notably Colin Pearson in 1953/4, John Solly in 1951, John Leach in 1959/60, Dan Finnegan in 1978 - in fact Winchcombe's roll of honour would make a good basis for a Who's Who of studio potters. Various members of the Finch family were involved in management and production. Mike Finch has run the pottery since 1979.